DeLuxe is a portfolio of sixty individually-framed prints hung in a rectangular grid formation comprising five rows of twelve, arranged in a sequence fixed by the artist. 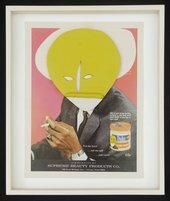 The work’s raw materials are advertisements drawn from magazines dating from the 1930s to the 1970s aimed at African American consumers, such as Ebony, Our World and Sepia. Extracts of textual advertisements and images of mainly female models have been cut and layered to create the effect of a collage. These advertisements promote a range of beauty products for women and men, especially goods relating to hair including wigs and pomades. Other publicity materials advertise items including slimming aids, underwear, feminine hygiene items and skin treatments, such as bleaching creams. Gallagher employed a variety of techniques to transform the advertisements, combining traditional printing processes of etching and lithography with recent developments in digital technology. The printed pages are principally black and white, but are punctuated by areas coloured grey, pink and red. With the title DeLuxe Gallagher draws ironically on the language of the advertisements as part of her project of subverting their original intentions; the word ‘deluxe’ appears in various spellings and fonts in different places in the prints. Following the printmaking process, Gallagher added a range of decorative elements onto the surfaces of many of the images including glitter, gold leaf and coconut oil – which has associations with Afro hair – as well as three-dimensional elements, that transform the prints into reliefs. These additions include toy eyeballs and pieces of intricately moulded coloured plasticine resembling masks and hairpieces, which are placed over models’ faces and heads. ‘Plasticine is meant to allude to [the] idea of mutability and shifting’, the artist has explained (quoted in ‘Ellen Gallagher Interview: eXelento and DeLuxe’). Moreover, her delicate moulding and sculpting of the plasticine produces forms that contrast with the geometry and order of the grid-like structure of the various wig advertisements (which show rows of heads wearing wigs) as well as the grid that the work as a whole forms. With interventions such as covering up models’ faces and whiting out or cutting out eyes, Gallagher emphasises the complexities surrounding the construction of identity, specifically in relation to race and gender. The artist’s use of collage to unite different parts of a range of models’ pictures and the addition of extravagant new hairstyles onto female heads advertising wigs produces unsettling juxtapositions. These transformations parody the ‘improvements’ offered by the advertisements and underscore in particular the role of hair as a signifier of difference. In one print derived from an advertisement for ‘Duke’ hair pomade, the artist covered the face of a black male model with yellow plasticine fashioned in a stylized shape suggesting an African mask. The mask that obliterates the face contrasts sharply with the model’s elegant suit and cigarette-holding hand. Making modifications to images drawn from old magazines is characteristic of Gallagher’s practice. DeLuxe developed directly from a series of magazine drawings that the artist produced for her exhibition Preserve (Drawing Center, New York, 2002). In terms of its size and complexity, DeLuxe is reminiscent of the slightly earlier work Pomp-Bang 2003 (Museum of Contemporary Art, Chicago), a vast canvas supporting some 396 images also derived from advertisements. What’s seen as political in [my] work is a kind of one-to-one reading of the signs as opposed to a more formal reading of the materials ... I think people get overwhelmed by the super-signs of race when, in fact, my relationship to some of the more over-determined signs in the work is very tangential. What I think is more repeated than that in the work is a kind of mutability and moodiness to the signs ... And I think that’s where you can talk about race in my work ... that idea of the abstract ‘I’ ... what it means to look at somebody who was eighteen in 1939 ... whatever she was. That’s specificity. It’s impossible to know who that was. But try anyway to have some kind of imaginative space with that sign ... Sometimes it’s hard for people who don’t make things to understand labor, joy, attention, and whimsy. But it’s in the work – I don’t think it’s something I need to explain. Gallagher lives and works in both New York and Rotterdam and made DeLuxe mainly in New York in collaboration with Two Palms Press. Tate’s version is one of four printer’s proofs from an edition of twenty. Suzanne P. Hudson, ‘1000 Words: Ellen Gallagher’, ArtForum, vol.42, no.8, April 2004, pp.128–31. Graham Coulter-Smith, ‘Ellen Gallagher: DeLuxe’, http://artinteligence.wordpress.com/2007/06/06/ellen-gallagher-deluxe/, accessed 7 January 2010, reproduced. , accessed 3 December 2009. The imagery for this print series is based on magazines dating from the 1930s to the 1970s aimed at African-American audiences, many of which feature advertisements for ‘improvements’ including wigs, hair pomades and skin bleaching creams. Gallagher transformed these images using a variety of printing techniques, combining traditional processes of etching and lithography with recent developments in digital technology. She also made modifications by cutting and layering images and text and adding a range of materials including plasticine, glitter, gold leaf, toy eyeballs and coconut oil. Her witty and sophisticated interventions emphasise the complex construction of identity.